Philly Free Streets is back again this year, this time on August 11! This year’s event features an eight-mile round trip route, between City Hall and Erie Avenue on North Broad Street and will create a car-free connection between Center City and the heart of North Philadelphia. Led by the Managing Director’s Office of Transportation & Infrastructure Systems (oTIS), Philly Free Streets temporarily closes streets to cars, inviting people to walk, bike, and play. 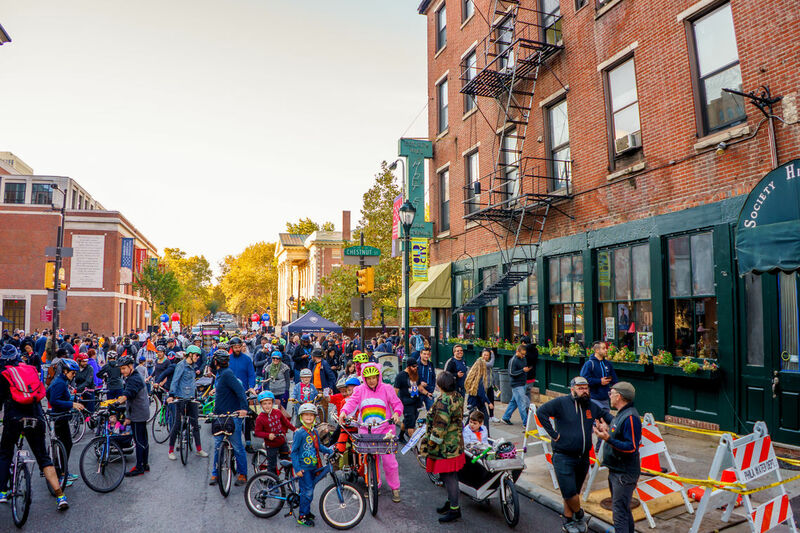 Philly Free Streets highlights active transportation options, as well as neighborhood walkability and its positive impacts on public health, the environment, business and the community. Participants are invited to join the car-free route at any point—there’s no formal start or finish: in fact, the organizers encourage participants to use SEPTA or Indego to join the route. Pennsylvania Horticultural Society's (PHS) Farm for the City: Located on the Thomas Paine Plaza, along North Broad Street, between John F. Kennedy Boulevard and Arch Street, PHS will be hosting a plant giveaway starting at noon (on a first come, first serve basis), as well as providing visitors with educational materials and coloring books about urban farming and community gardens. The Pennsylvania Academy of the Fine Arts (PAFA): Free admission to the museum all day, participate in chalk drawing activities on the PLAZA and make wearable butterfly art. The School of Pennsylvania Ballet: Join them at Wood Street for ‘Dance Me a Story!’ where kids will learn how to tell a story with dance. Mural Arts Philadelphia: Mural Arts Philadelphia will be at several locations along the route, including at Fairmount Avenue for family-friendly make-and-take art activities. North of Girard Avenue, a Mural Arts Philadelphia docent will be nearby to share information about “North Philadelphia Heroes” mural by Cliff Eubanks. South of Cecil B. Moore Street, Mural Arts Philadelphia will be coloring in a jazz-themed median between Oxford Street and Cecil B. Moore Ave. At Susquehanna Avenue, join Mural Arts Philadelphia and Uptown Theater for a community paint day. Participants will be invited to paint a mural that tells the history of the Uptown Theater. South of Lehigh Avenue, stop by and say hello to a Mural Arts Philadelphia docent to learn more about “Wall of Rugs” mural by Kathryn Pennypacker. At North Broad Street & Germantown Avenue, join Mural Arts Philadelphia in partnership with the Free Library Nicetown-Tioga Branch to highlight public libraries in Philadelphia through a ground mural. Temple University: Philly Free Streets’ presenting sponsor will offer programming focused on health and fitness, art, music and the community at Montgomery Ave. Community members and participants are invited to tour the campus, engage in do-it-yourself stations like drum-building and magnetic mosaics and learn more about the Pan-African Studies Community Education Program. Then & Now: Black History on North Broad Street: Did you know North Broad Street has a rich history of African American history, including civil rights activism, jazz, and more? Brought to you by North Central Philadelphia CDC/RCO—in partnership Leon H. Sullivan Trust, Joe Frazier Scholarship Fund, Uptown Theater, and more—join the neighbors of North Broad Street for a scavenger hunt to learn about North Broad’s history. Pick up your railroad ticket to history at any of the six Philly Free Streets rest areas along the route. A map of the route and list of Philly Streets programming can be found at www.PhillyFreeStreets.com. ​Share your fun on social media using hashtags #ThinkBroad #PhillyFreeStreets. Where to go for outdoor trail adventures in the Philadelphia region! Everything Philly has to offer for your best summer on a budget!